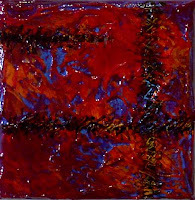 The Abstract Series was started in midwinter of 2006. I consider the Abstract Series to be a forerunner to the Grid and Genesis Series. This group of textured paintings was the first to be created using Golden Heavy Gel in order to form peaks and texture on the canvas. Once the gel dried, various colors were glazed over each other, resulting in 5+ layers of paint in order to achieve maximum vibrancy for each painting. As far as an actual theme goes, my sole purpose in creating this series was for experimental reasons so that I could learn a new application technique and use that knowledge in future works.